Following on from last week’s post on the #edcmooc, the course itself has turned to explore the notion of MOOCs in the context of utopian/dystopian views of technology and education. The questions I raised in the post are still running through my mind. However they were at a much more holistic than personal level. This week, I’ve been really trying to think about things from my student (or learner) point of view. Are MOOCs really changing the way I engage with formal education systems? On the one hand yes, as they are allowing me (and thousands of others) to get a taste of courses from well established institutions. At a very surface level who doesn’t want to say they’ve studied at MIT/Stanford/Edinburgh? As I said last week, there’s no fee so less pressure in one sense to explore new areas and if they don’t suit you, there’s no issue in dropping out – well not for the student at this stage anyway. Perhaps in the future, through various analytical methods, serial drop outs will be recognised by “the system” and not be allowed to join courses, or have to start paying to be allowed in. But on the other hand, is what I’m actually doing really different than what I did at school and when I was an undergraduate or was a student on “traditional’ on line, distance courses. Well no, not really. I’m reading selected papers and articles, watching videos, contributing to discussion forums – nothing I’ve not done before, or presented to me in a way that I’ve not seen before. The “go to class” button on the Coursera site does make me giggle tho’ as it’s just soo American and every time I see it I hear a disembodied American voice. But I digress. The element of peer review for the final assignment for #edcmooc is something I’ve not done as a student, but it’s not a new concept to me. Despite more information on the site and from the team this week I’m still not sure how this will actually work, and if I’ll get my certificate of completion for just posting something online or if there is a minimum number of reviews I need to get. Like many other fellow students the final assessment is something we have been concerned about from day 1, which seemed to come as a surprise to some of the course team. During the end of week 1 google hang out, the team did try to reassure people, but surely they must have expected that we were going to go look at week 5 and “final assessment” almost before anything else? Students are very pragmatic, if there’s an assessment we want to know as soon as possible the where,when, what, why, who,how, as soon as possible. That’s how we’ve been trained (and I use that word very deliberately). Like thousands of others, my whole education career from primary school onwards centred around final grades and exams – so I want to know as much as I can so I know what to do so I can pass and get that certificate. That overriding response to any kind of assessment can very easily over-ride any of the other softer (but just as worthy) reasons for participation and over-ride the potential of social media to connect and share on an unprecedented level. As I’ve been reading and watching more dystopian than utopian material, and observing the general MOOC debate taking another turn with the pulling of the Georgia Tech course, I’ve been thinking a lot of the whole experimental nature of MOOCs. We are all just part of a huge experiment just now, students and course teams alike. But we’re not putting very many new elements into the mix, and our pre-determined behaviours are driving our activity. We are in a sense all just ghosts in the machine. When we do try and do something different then participation can drop dramatically. I know that I, and lots of my fellow students on #oldsmooc have struggled to actually complete project based activities. 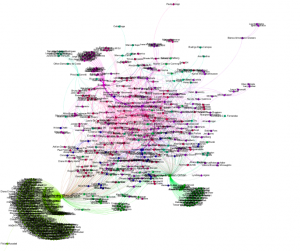 The community element of MOOCs can be fascinating, and the use of social network analysis can help to give some insights into activity, patterns of behaviour and connections. But with so many people on a course is it really possible to make and sustain meaningful connections? From a selfish point of view, having my blog picked up by the #edcmooc news feed has greatly increased my readership and more importantly I’m getting comments which is more meaningful to me than hits. I’ve tried read other posts too, but in the first week it was really difficult to keep up, so I’ve fallen back to a very pragmatic, reciprocal approach. But with so much going on you need to have strategies to cope, and there is quite a bit of activity around developing a MOOC survival kit which has come from fellow students. 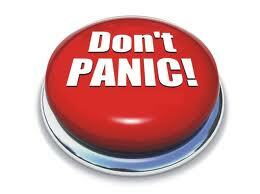 As the course develops the initial euphoria and social web activity may well be slowing down. Looking at the twitter activity it does look like it is on a downwards trend. Monitoring this level of activity is still a challenge for the course team and students alike. This morning my colleague Martin Hawskey and I were talking about this, and speculating that maybe there are valuable lessons we in the education sector can learn from the commercial sector about managing “massive” online campaigns. Martin has also done a huge amount of work aggregating data and I’d recommend looking at his blogs. This post is a good starting point. Listening to the google hang out session run by the #edcmooc team they again seemed to have under estimated the time sink reality of having 41,000 students in a course. Despite being upfront about not being everywhere, the temptation to look must be overwhelming. This was also echoed in the first couple of weeks of #oldsmooc. Interestingly this week there are teaching assistants and students from the MSc course actively involved in the #edcmooc. I’ve also been having a play with the data from the Facebook group. I’ve had a bit of interaction there, but not a lot. So despite it being a huge group I don’t get the impression, that apart from posting links to blogs for newsfeed, there is a lot of activity or connections. Which seems to be reflected in the graphs created from the data. This is a view based on friends connections. NB it was very difficult for a data novice like me to get any meaningful view of this group, but I hope that this gives the impression of the massive number of people and relative lack of connections. There are a few more connections which can be drawn from the interactions data, and my colleagye David Sherlock manage create a view where some clusters are emerging – but with such a huge group it is difficult to read that much into the visualisation – apart from the fact that there are lots of nodes (people). I don’t think any of this is unique to #edcmooc. We’re all just learning how to design/run and participate at this level. Technology is allowing us to connect and share at a scale unimaginable even 10 years ago, if we have access to it. NB there was a very interesting comment on my blog about us all being digital slaves. Despite the potential affordances of access at scale it seems to me we are increasingly just perpetuating an existing system if we don’t take more time to understand the context and consequences of our online connections and communities. I don’t need to connect with 40,000 people but I do want to understand more about how, why and how I could/do. That would be a really new element to add to any course, not just MOOCs (and not something that’s just left to a course specifically about analytics). Unless that happens my primary driver will be that “completion certificate”. In this instance, and many others, to get that I don’t really need to make use of the course community. So I’m just perpetuating an existing where I know how to play the game, even if it’s appearance is somewhat disguised. It had to happen at some time, and not sure if it was karmic retribution or chaos theory, or plain old sod’s law that this week the first high profile MOOC collapse occurred with the pulling of Georgia Tech’s Fundamentals of Online EducationCoursera MOOC. As many have already commented the route of the problem was the actual course design and implementation. From what I have seen on the twitter and blog-o-spheres, some very fundamental issues such as trying to promote group work without a clear reason as to why it was necessary coupled with technical problems with the chosen technology to facilitate the work general lack of guidance and support, all ask question of the underlying course design and quality assurance processes of (in this instance) Coursera MOOCs. But there are more fundamental questions to be asked about the actual design processes used by the staff involved. As readers of this blog will know, I’m documenting my own “adventures in mooc-land” at the moment, and I’m in week 4 of #oldsmooc, which is all about learning design. This week is very much focused on the practicalities and planning stages of a design – be that a whole course or an individual activity. The week is led by Professor Diana Laurillard and Dr Nial Winters of the London Knowledge Lab with Dr and Steve Warburton from the University of London. The week started with a webinar where Diana introduced the PPC (Pedagogical Patterns Collector). Designing for MOOCs were inevitably part of the discussion, and Diana raised some very pertinent points about the feasibility of MOOCS. Well it would seem that the design used by the Georgia tech course is one that shouldn’t be shared – or is that case? 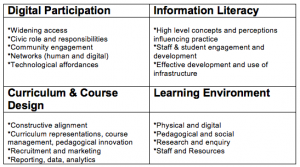 Elements of what they were suggested can (and have worked even in MOOCs). So can we actually turn this round and use this in a positive way? The community can help you Coursera if you let it. It’s half way through week three of #oldsmooc, and once again I have been distracted from the actual course by the possiblities (and opportunities) that a bit of tweaking to Cloudworks could offer. 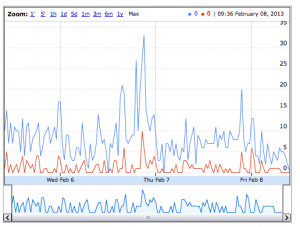 One of the comments Tony Hirst made last week about the practicalities of including some of the network visualisation experiments he had been working on was that of caching and time for real-time diagrams to appear on a user page. Good point, well made, as they say – I don’t think this is insurmountable but it’s not going to be the focus of this week’s post, I’ll come back to it again. But I do think that this is exactly the type of user centred feature that any “new and exciting” (cos of course none of them are “as dull and boring” as the platforms we already have) mooc platform” should be trying to incorporate. This week’s data challenge was much simplier really and you can see the twitter chain of events in this storify. Once again Tony came up trumps and created a lovely visualisation, but as my last tweet said, was this maybe a bit too much? And as Tony himself asked earlier -what does another view “buy you”? In this case, where there is a essentially a growing list of four different types of “things” maybe just an simpler alternative view (without all the connections) would be more helpful? 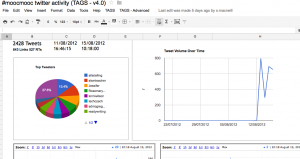 As the list grows it would be helpful to be able to quickly search for example the tools. This page is undoubtedly a useful resource and as such a bit of time in ensuring that is displayed in ways that help people use/contribute and sustain it is surely worth while. I’d be interested in any other suggestions people may have. I’m now going to do some more of the actual course work and try to respond to this. Like many others I was introduced to A Bill of Rights for Learners in a Digital Age” yesterday. And like a few others was slightly confused by it. I think there is maybe a slight tendency for us the UK to be slightly skeptical of anything claiming to be a “bill of rights”. It’s a bit too American, too explicit for those of us used to having an unwritten constitution underpinning our version of democracy. After reading the document, lots of questions ran through my head: what can a learner do with this constitution? how does it protect their rights? who/how/what/why signs up for it? Which brought me to thinking is this really for learners? Or is it actually for teachers/ educational institutions/governments in terms of giving them a framework for providing the “right” context for learning to take place? Is this actually a teachers/teaching bill of rights? Perhaps because I’m taking part in #oldsmooc which is about learning design, the subtleties of distinctions between learning and teaching are higher than normal on my agenda. As it has been pointed out on many occasions, learning design could actually be called teaching design as it is in fact in many ways more about the teaching side of education than learning. Sometimes we have a tendency to use learning when we mean teaching, and teacher when we mean learner. This again was highlighted by Stephen Downes in his response to my review of the Larnaca Learning Design Declaration (which isn’t really a declaration but let’s not get caught up in more semantic circles). As someone involved in the drafting of “the Bill”, Audrey Watters has written a really useful post on the process and her own thoughts on the the process and terminology used. I found this extremely useful in understanding how, and by whom, the document was written. Audrey’s article highlights another conundrum in terms of the use of “student’ and “learner”. Again bringing me back to my questions about who this is bill is actually for. I do think there are some fundamental issues and some which will become increasingly important i.e. ownership and use of data which “the bill” highlights. As with the other announcements from the folks at Hybrid Pedagogy, Audrey is advocating hacking this initial document and getting much wider involvement in its development. I’m not sure I’m really adding anything constructive here, but I do think if this is to gain any traction it needs to be clear who this is for. Maybe this needs to evolve into a set of “bills/manifestos/declarations” call them what you will, explicitly directed at students, learners, teachers administrators but with some common underpinning themes to ensure we are all contributing to building successful learning cultures. Well I have survived week 1 of #oldsmooc and collected my first online badge for doing so -#awesome. 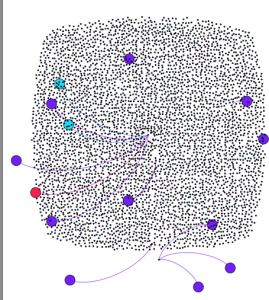 My last post ended with a few musings about networks and visualisation. I’m also now wondering if a network diagram of cloudscape (showing the interconnectedness between clouds, cloudscapes and people) would be helpful ? Both in terms of not only visualising and conceptualising networks but also in starting to make more explicit links between people, activities and networks. Maybe the mindmap view is too linear? Think I need to speak to @psychemedia and @mhawskey . . .
I’ve been really pleased that Tony Hirst has taken up my musings and has been creating some wonderful visualisations of clouds, cloudscapes and followers. So I should prefix prefix this post by saying that this has somewhat distracted me from the main course activities over the past few days. 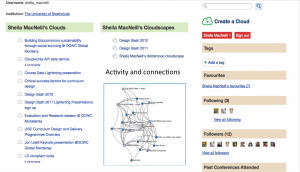 However I want to use this post to share some of my thoughts re these experiments in relation to the context of my learning journey and the potential for Cloudworks to help me (and others) contextualise their learning, activities, networks, and become a powerful personal learning space/ environment. Cloudworks seems to be a bit like marmite – you either love or hate it. I have to admit I have a bit of a soft spot for it mainly because I have had a professional interest in its development. (I also prefer vegemite but am partial to marmite now and again). I’ve also used it before this course and have seen how it can be useful. In someways it kind of like twitter, you have to use it to see the point of using it. I’ve also fully encouraged the development of its API and its open source version Cloud Engine. A short bit of context might be useful here too. 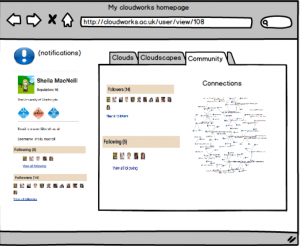 Cloudworks was originally envisaged as a kind of “flickr for learning designs”, a social repository if you like. However as it developed and was used, it actually evolved more into an aggregation space for ideas, meetings, conferences. The social element has always been central. Of course making something social, with tagging, favouring etc, does mean that navigation isn’t traditional and is more “exploratory” for the user. This is the first time (that I know of anyway) it has actually been used as part of a “formal” course. 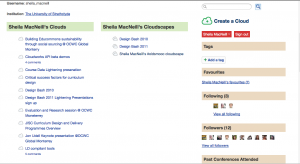 As part of #oldsmooc, we (the leaners) are being encouraged to use Cloudworks for sharing our learning and activities. As I’m doing a bit more on the course, I’m creating clouds, adding them to my own #oldsmooc and other cloudscapes, increasingly favouriting and following other’s clouds/cloudscapes. I’m starting to find that concept of having one place where my activity is logged and I am able to link to other spaces where I create content (such as this blog) is becoming increasingly attractive. I can see how it could really help me get a sense of my learning journey as I process through the course, and the things that are useful/of interest to me. In other words, it’s showing potential to be my personal aggregation point, and a very useful (if not key) part of my personal learning environment. But the UI as it stands is still a bit clunky. Which is where the whole visualisation thing started. Now Tony has illustrated how it possible to visualise the connections between people, content, activities, what think would be really useful would be an incorporation of these visualisations into a newly designed profile page. Nick Frear has already done an alpha test to show these can be embedded into Cloudworks. Excuse the very crude graphic cut and paste but I hope you get the idea. There’s lots of space there to move things around and make it much more user friendly and useful. Ideally when I (or any other user) logged into our profile page, our favourite spaces and people could easily been seen, and we could have various options to see and explore other network views of people/and our content and activities. Could these network views start to give learners a sense of Dave Cormier’s rhizomatic learning; and potentially a great level of control and confidence in exploring the chaotic space which any MOOC creates? The social “stuff” and connections is all there in Cloudworks, it just needs a bit of re-jigging. 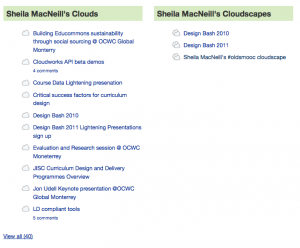 If the UI could be redesigned to incorporate these ideas , then I for one would be very tempted to use cloud works for any other (c)MOOC I signed up for. I also need to think a lot more about how to articulate this more clearly and succinctly, but I’d be really interested in other views. One of the most enjoyable aspects of the programme support aspect of my job is that I get to find out about a lot of really innovative work taking place across a diverse range of UK universities. On the flip side of this, I do sometimes yearn to be part of the development of projects instead of always just being on the outside looking in once plans have been made and funding secured. I also often wonder if anything I write about in my blog does actually make any difference or is useful to the wider to community. So I was delighted yesterday to spend the afternoon at Edinburgh Napier University at an internal seminar exploring their digital future and technological ambitions. I was even more delighted a couple of weeks ago when Keith Smyth contacted me about attending the event, and said that the series of blog posts I wrote with my Strathclyde colleague Bill Johnston on the Digital University, had been really useful and timely for Napier in terms of them starting to think about how to develop their approach to a digital strategy. Yesterday’s seminar was an opportunity for staff from across the institution to come together and share their experiences and views on what their real needs and aspirations are in terms of the future (digital) shape of the university. Napier are already involved in a number of innovative projects internally, and are committed to open practice, particularly in regards to their work in learning technology. For example their 3E Framework for effective use of technology in teaching and learning, is available via a CC licence and is being used/adapted by over 20 institutions worldwide who have all agreed to share their adaptations. A great example of how open practice can not only improve internal working practices but also have an impact in terms of helping community knowledge grow in an open, shareable way too. The framework is also linked to a resource bank,with examples of the framework in action, which again is openly available. Like many institutions, podcasting is a growing trend and their College2Uni podcasts which were originally designed to help student transition from college to university are now being used for wider community driven information sharing initiatives. Plans for an open access journal are also well underway. Again, another wee ego boost, was seeing how the matrix Bill and I have developed, provided a framework for the discussions and planning of the workshop. It was also a good opportunity for me to highlight work from a number of JISC programmes including Developing Digital Literacies, Assessment and Feedback, and Curriculum Design and Delivery and the growing number of resources from all these programmes which are available from the Design Studio. There was a genuine enthusiasm from all the delegates a number of suggestions for easily achievable short term goals including single sign on for all uni accounts, more co-ordinated and easily accessible communication channels (for staff and students), experimenting with lay out of lecture spaces, developing a more coherent strategy for mobile devices. Longer term goals were generally centred on ubiquitous access to information, continuous development of staff and student skills including supporting open practices, ways to differentiate Napier and how to take advantage of affordances of the all pervasive MOOCs and indeed the changing landscape of HE. Content maybe more plentiful in 2020 but not everyone has the skills to take an MIT/Stanford/Everyotherbignameuniversity open course without support. There are a lot of skills which we know employers are looking for which aren’t supported through these large scale distance models of education. The need for new spaces (both digital and physical) for experimentation and play for both staff and students was highlighted as a key way to support innovation. You can get a flavour of the discussion by searching the #digiednap archive. and work on more strategic developments over the coming year. I am really looking forward to working with colleagues in Napier as a critical friend to these developments, and being part of a project from the outset and seeing first hand how it develops.